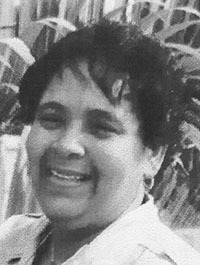 Augustus Funeral Home regrets to announce the passing of Winifred Joan Bovell. A Memorial service for Winifred Joan Bovell, beloved daughter of the late Henry and Myrtle Butterfield, beloved mother to Lakeisha Seymour, Anthony and the late Gilbert Bovell, beloved sister of Karen Christopher [Wendell], Sonya Outerbridge [Stephen] and the late Marie Dyer, in her 75th year of Francis Telford Nursing Home, 32 Point Finger Road, Paget will be held at Augustus Funeral Home Today, December 1, 2018 at 11:00 am. In lieu of flowers donations may be made to the LCCA, PO Box HM64, Hamilton, HM AX in memory of Joan Bovell. Lovingly remembered by grandchildren: Brant, Chantelle, Henry, Sierra and Camille; nephews: Kent [Caroline] Chris, Michael [Delkeesha], Stephen and the late Noel Dyer; nieces: Alicia [Ronald] and Kryshae [Tarreko]; great nephews: Che, Matthew, Zyun, Joel, Nathan, Zayne and Delano; great nieces: Zoe, Zaida, Shania and Kamryn; special cousins: Pamela Woolaston and Prudence Fraser; special friends: Suzanne Smith, Beverley Dyer, Freeman King Trott, Charmaine Robinson, Tamisha Tuzo, Nelda Walker and the late Alice Godfrey, the Francis Telford Nursing Home family, the Church of Christ family and other relatives and friends too numerous to mention.